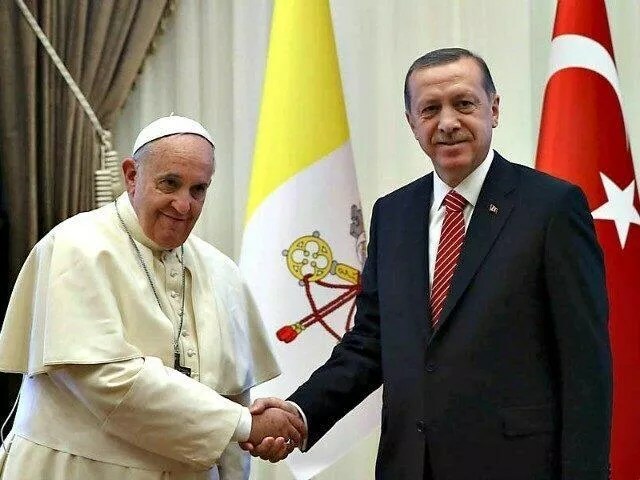 Erdoğan to Meet Pope Francis in Vatican In Februrary – Coercion Code – "Dark Times are upon us"
President Recep Tayyip Erdoğan will visit the Vatican on Feb. 5 upon the invitation of Pope Francis and will thank to the plaintiff for his support on Jerusalem, the Sabah newspaper reported on Jan. 16. The meeting comes after Pope Francis voiced opposition to the United States’ unilateral decision to recognize Jerusalem as the “undivided” capital of Israel. He also supported Turkey-sponsored initiatives to nix the U.S. bid at the U.N. General Assembly. Erdoğan and the Pope spoke a number of times on the phone in early December, as the former invited the pontiff to attend an extraordinary summit of the Organization of the Islamic Conference (OIC) held in Istanbul amid the Jerusalem crisis. Sabah reported that in the meeting Erdoğan plans to underline the need to protect Jerusalem as “the holy city of three divine religions” and will ask continued support of the Holy See as the representative of the Christian world. The two leaders will also discuss developments in Iraq and Syria, as well as ongoing migration flows. Pope Francis made an official visit to Ankara in late 2014, becoming the first international guest of the massive presidential complex in Ankara. Erdoğan’s trip to the Vatican will be a return visit to the Holy See. Following the Vatican trip, President Erdoğan will embark on a tour to three Latin American countries – Venezuela, Brazil and Paraguay – Sabah reported, adding that the talks will be focused on economic cooperation. Venezuelan President Nicolas Maduro paid two visits to Turkey in 2017, first as part of an official trip and the second one as the head of the Non-Aligned Movement countries attending the OIC summit in Istanbul.